Property Size 576 sq. ft. 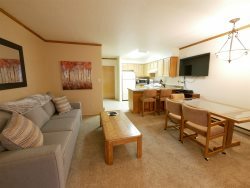 This beautifully updated, spacious main-level Wolf Lodge condominium #105, sleeps four people. This condo has a large living/ dining area with a sofa sleeper and a fully stocked kitchen for all your cooking needs. Master bedroom has a queen bed and a sliding door that enters onto a patio. The Hot tub is open year-around and the pool is open during the summer from Memorial weekend to Labor Day weekend. Book now for the winter season. Just minutes to Powder Mountain, Snowbasin or Nordic Valley Resorts. You can also enjoy Snowshoeing, Cross-country Skiing, Snowmobiling, & Sledding, year around wildlife viewing of Moose, Elk, Deer or Horseback ride,shopping. Take in Shopping, restaurants and sightseeing. The adventure is here for everyone! During the summer this condo will accommodate all your needs while enjoying the outdoor activities. Hiking and Biking trails within minutes of the front door. Golfing, boating, kayaking and whitewater rafting is a few of the many adventures you can have in beautiful Ogden Valley. Fireplace, TV, DVD, VCR, Stereo, Sofa Sleeper, Fully equipped Kitchen, Coffee Maker, Microwave, Dishwasher, Refrigerator, Cooking Utensils provided, Linens provided, Hot Tub, Sauna, Pool, Outside Ski Locker, No Smoking, No Pets.